It’s hot out these days. And while W loves to play outside, I’m concerned with keeping him cool. He’s a huge fan of the water table so I’ve been doing my best to come up with easy ideas to make the water table just a bit more fun! 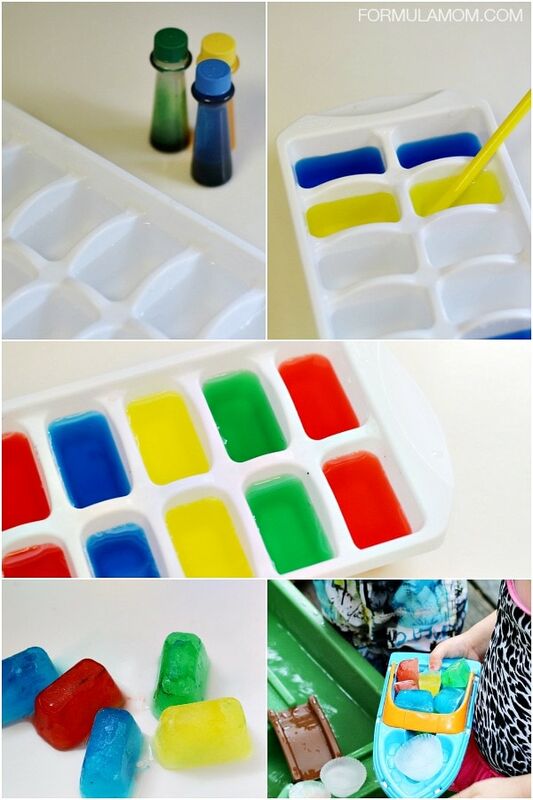 Colored ice cubes are one of my recent ideas and one of my easiest! It’s pretty self-explanatory but I thought I would share just in case you want to see the easy steps I took to put these together! I had everything I needed to make these already in the kitchen. Although I am getting low on my food coloring so I need to stock up again! I used my gel colors in hopes of getting more vibrant colors but I’m sure regular food coloring would work. 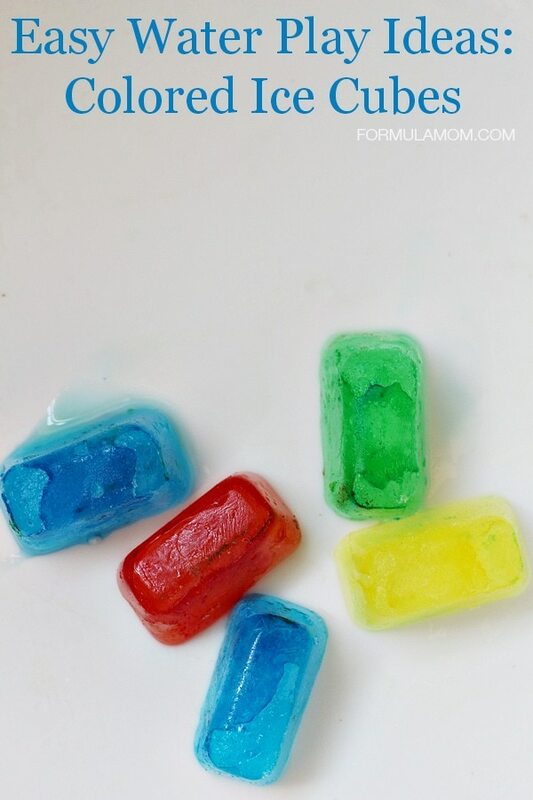 Add 2-3 drops of food coloring into each ice cube. Mix gently with a toothpick, popsicle stick, or straw. Put in freezer. Leave in freezer for 2-3 hours of until completely frozen. Add them to the water table and enjoy! We used these at a recent water play date and they were a huge hit! They’re fun to watch melt in the water table but they are also fun to sort by color. We also had ice cube races down the ramps in our water table. 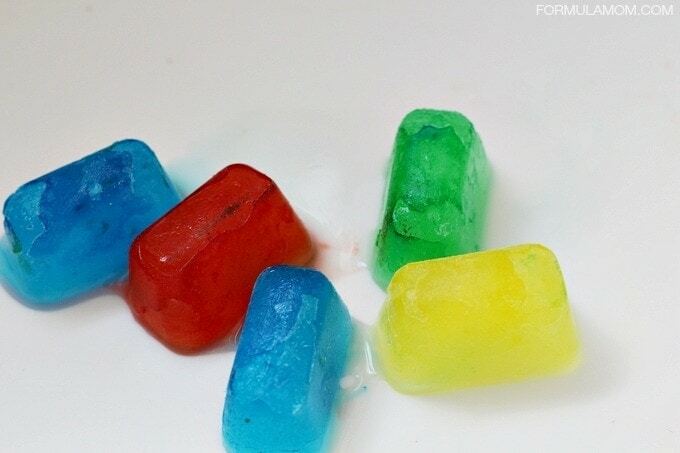 It was easy to make up games to go with the colored ice cubes. Next time I think I’ll make a few more colors by mixing my primary food colors together. W wanted to know where the purple ones were! What colors would you make for your kids? « Q-Tip Fireworks Craft for the 4th of July! This is such a great idea! I would buy the neon colored food coloring. My daughter would love the neon pink. Thanks for sharing the great idea. Great idea for fun in the sun, great that there colored, also can help teach the younger ones about colors. Love this. I love this idea and I am making some today for the kids to enjoy and have fun. My grandsons would love if I made this for them. We would make lots of blues and greens because those are their favorite colors. What a great idea for kids. I would make purple, pink, orange, green and yellow ones. I love your ideas.